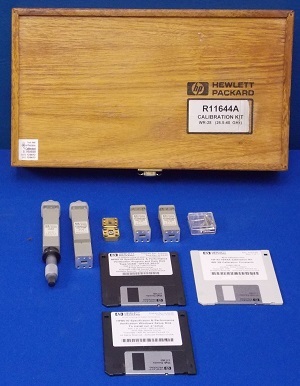 The Agilent R11644A calibration kit contains the precision mechanical standards required to calibrate the systematic errors of Agilent network analyzers. This calibration kit has a precision airline for performing the Thru-Reflect-Line (TRL) calibration, the most accurate error-correction technique for coaxial measurements. This kit also contains a commercial calibration certificate, flush short circuit, a precision shim, and a fixed termination. 11644-60004 Load, 1644-60001 Standard Section, 11644-60016 Standard section, WR-28 Calibration Constants 11644-10012,08510-1003 HP8510 Specifications and Performance.